Search Results for "friends at the disco"
Point of view shot of young lady blogger recording video for her blog at rooftop party dancing and having fun with friends. Vlogging, youth and disco concept. LVIV, UKRAINE - SEPTEMBER 6, 2017: Group of friends partying dancing to music at disco neon lights nightclub outdoors. 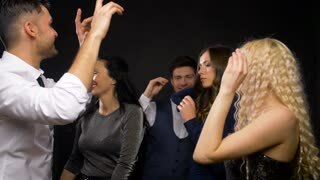 Cheerful nerd man with glasses dancing and partying with friends. He is happy and having fun. Disco king with good humor feeling concept. Nightclub pub, a professional bartender preparing a sangria cocktail mixing together brandy, lemon juice, lemonade concentrate, orange juice, red wine, triple sec, and sugarwith alcohol. Disco, fun, friends. in a nightclub or pub, a professional bartender preparing a cocktail with ice a mix of alcohol. The barman measure quantities for a perfect cocktail. concept: disco, fun, friends, cocktail. 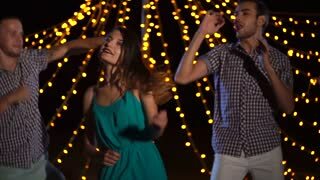 At the House Party: Diverse Group of Friends Have Fun, Dance, Jump, Socialize. Stylish Young People Clubbing. Disco Neon Lights. In Slow Motion.